What's all this about? A war game where players focus on building a simple economy, spend resources on research, training armies, looting ruins, capturing native villages and enemy towns. This started out as designing a watered down civilization sort of thing but later decided it was too complicated to be a fun mobile port. Detailed empire management games take days to play and if I was to play an empire management game I would surely pick to play on the Pc rather than a mobile device so why even bother with battery issues? How can i think of a long term strategy when i will be playing during the bus ride? It's not really feasible to play such games in a pick up and play fashion. You would have to reeeaaaaly water it down to the level that you have few research branches, few resources and very basic combat so it would be an insult to name it a 4x. What i want is simplified mechanics where you don't have to babysit hundreds of units around the map one by one or shoudnt think of what to research among a tangled research tree. But it should also involve a bit of thinking and strategy, so it shouldn't be about mass production and rush. Players should focus on building a simple economy, spend resources on research, training armies, looting ruins, capturing native villages and destroying enemy towns. They should be able to complete a game in 1 hour max. Can be turn based or “real time with pause”. I’m leaning towards the realtime with pause option as people shouldn't keep pressing end turn on such a mobile game where you wait to gather resource. So roughly speaking if it was a turn based game, every turn would have equaled to 3 or 4 seconds in real time. At the end of x turns (or x minutes since its real time) the game is over and the player with the highest score wins. Alternatively, the one who wipes all other players wins. Not sure… didn't really think too much on this. 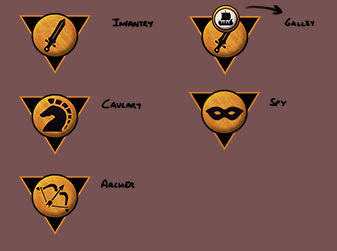 Not that I really care either as by default i just thought of using counters with simple shapes on them so there would be no nations or civs, making every faction the same as other. Some may enjoy different factions with various pros and cons but it's not a priority. Colonial era nations (spanish, british, portuguese, dutch etc)? Strange aliens (insectoids, plantoids, hawkmen etc) who dress up like colonial era humans? Regardless, it's not a priority. Game starts with a set number of resources (ie 500 food 500 mat 500 pop) and a Town Center which gives a small amount of each resource. the first priority should be to build enough structures to create a stable economy. Food and Raw Materials can be collected from tiles that have resource icons. Building a farm on a tile with a food icon will start earning the player resources every 4 seconds. Population is collected from houses built on empty grass tiles. Raw Materials - used for construction of structures and training units. Population - used for buying military units also more pop you have faster you build, train and research. Population can be gathered from towns and houses. So the player has to balance population and armies. One could also try to rush military units at the start of the game but as military units consume population, such move would leave the player’s economy crippled for a while. Should keep this as simple as possible. I go back and forth between a “Research” and an “Upgrade” system. Both have their pros and cons. 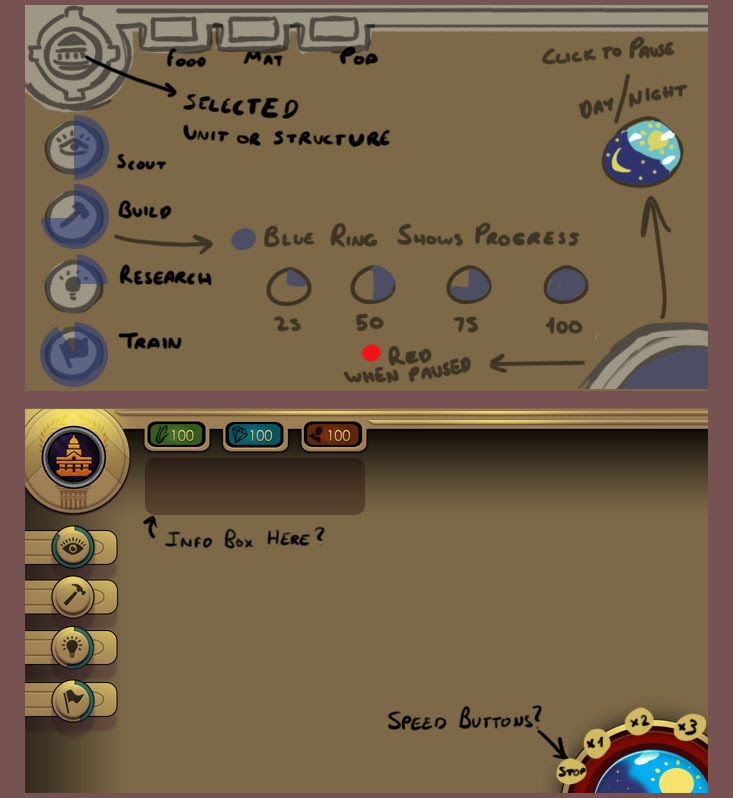 Research systems allow the players to to pick a “path” and there is always the fun of unlocking something unknown or new. But these paths can end up being complicated (research x and y to open the path to z) or illogical. Upgrade system makes the tech tree visible from the start so there is no fun of discovering or no paths to pick from but since everything is given clearly it's easier to understand. Upgrade swords 1,2,3 lasers 1,2,3 etc. it's very simple to use so i’ll probably stick to upgrades instead of research. 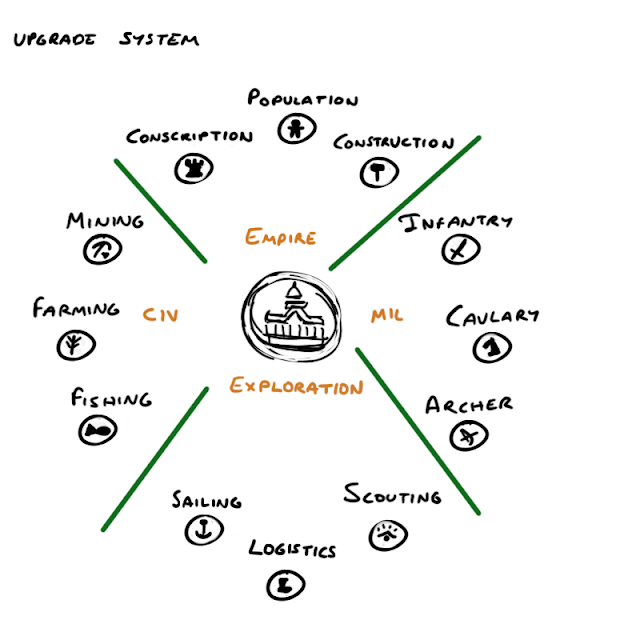 Upgrade tree is divided into 4 categories as military, civics, empire and exploration. Each of these categories have a number of topics. Upgrading costs food. Once The player picks an upgrade the cost of research is deducted from the player's food stock and research takes some time to complete. Once complete, the player earns the bonus provided by that topic. Each topic can be upgraded to a maximum of 3 times. (borders 1,2,3 scouting 1,2,3 etc) each level of research requires more food. There are a total of 3 types of controllable armies. 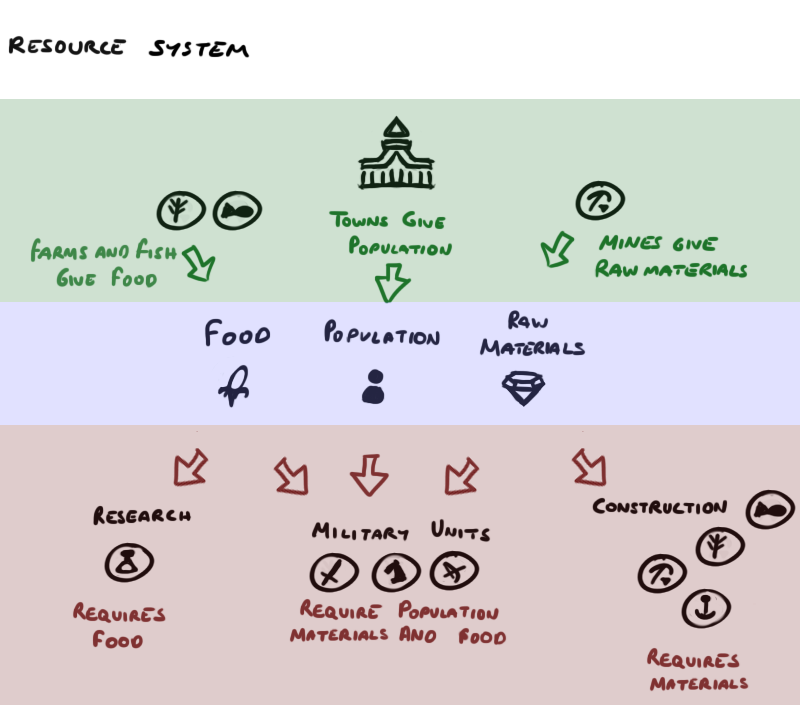 Producing military units requires food, materials and pop per army from the player. All units have the same stats. 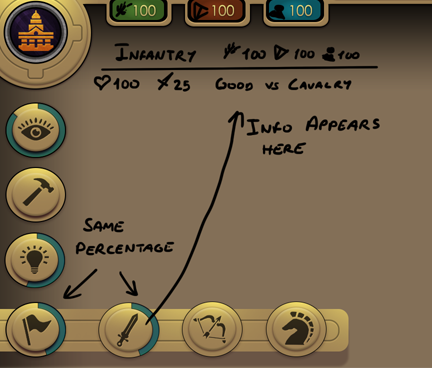 Infantry - 100 food 100 mat 100 Pop gains %25 attack bonus when fighting vs cavalry. Ship - Armies transform into ships when they move on a dock controlled by the player. This is just a cosmetic change as the army properties remain same - infantry ship, cavalry ship, archer ship etc. The ship will disappear once the army embarks on a shore. The army will have to find a new dock to embark into a new ship. Spy - 125 food 125 mat 50 Pop - spies are slow moving invisible units and cannot fight. They can only be detected when they are in a neighbour tile occupied by other spies, armies, houses or town centers. Once a spy is detected an army can attack and kill the spy before the spy can move away from the detector and become invisible again. 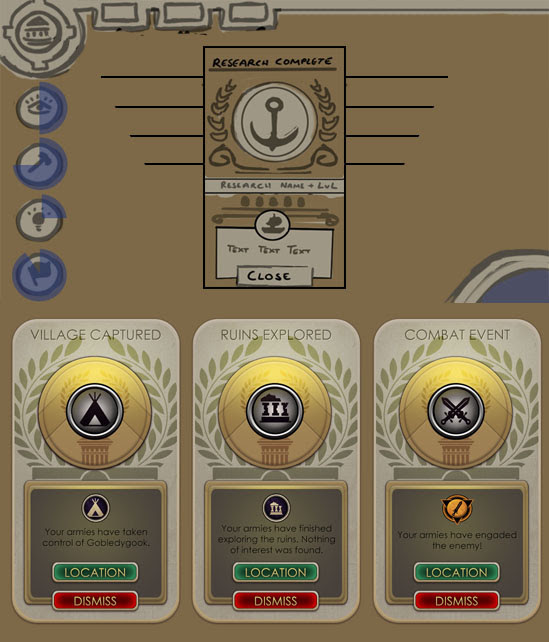 Spies can sabotage resource production speed of other players if they can reach their town centers. This action removes the spy from the game even if it succeeds or fails to sabotage. Spies can poison native villages if they can enter the village tile. The spy will have a 60% chance to poison the village and reduce its defences by 50% This action removes the spy from the game even if it succeeds or fails to poison. All stats and their values are the same for infantry, cav and arch. 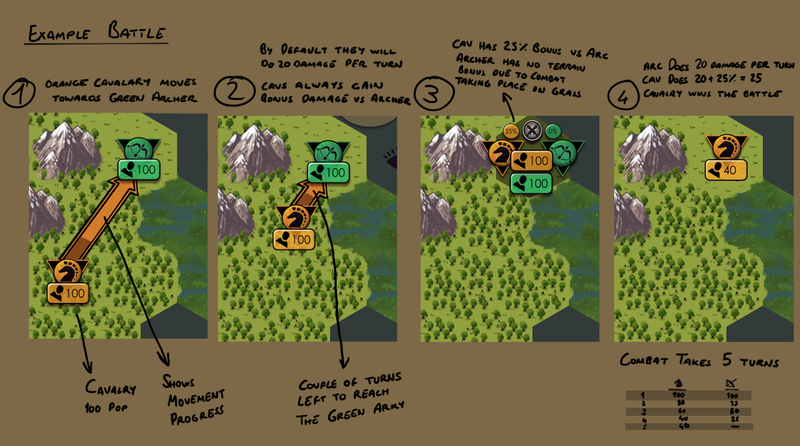 Attack - Damage the army can deal to its enemy in combat (per turn) Ideally a unit should start with 20 attack per second and gain attack bonus per research level. Sight - all armies reveal the 1 tile radius around them. Note - if 3 or more armies enter combat, should find a system to automatically line them up for combat one after another army is destroyed. Move - tap army, tap destination, an arrow shows where it will move, and the army will start moving. Combat - you can fight enemy armies by moving on the same tile. Research - click the research button, scroll among projects with left and right arrows or tap on the desired project to start research (speed depends on pop available) maybe should add cancel or pause buttons, not sure. Train - click train, click inf, cav or archer. Click on an empty town center on map. When the training is complete, the selected unit will be placed on the town center. Only one unit can be trained at a time per town center. 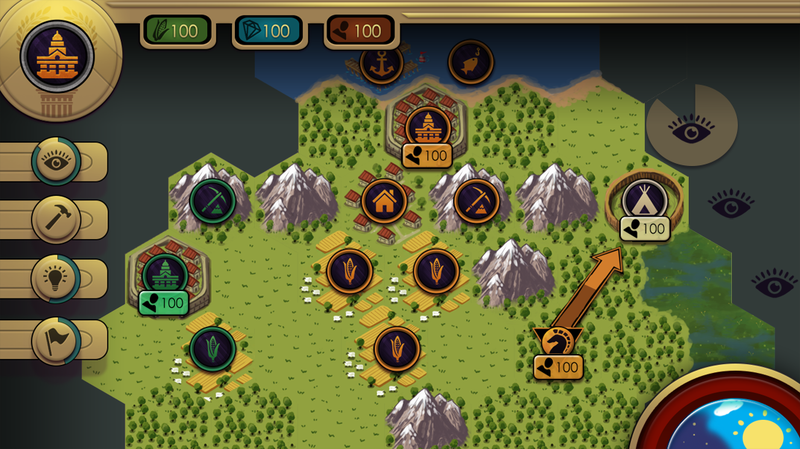 In order to train more units it’s advised to capture enemy Towns or native Villages. Stuff can only be built inside the player’s empire borders. 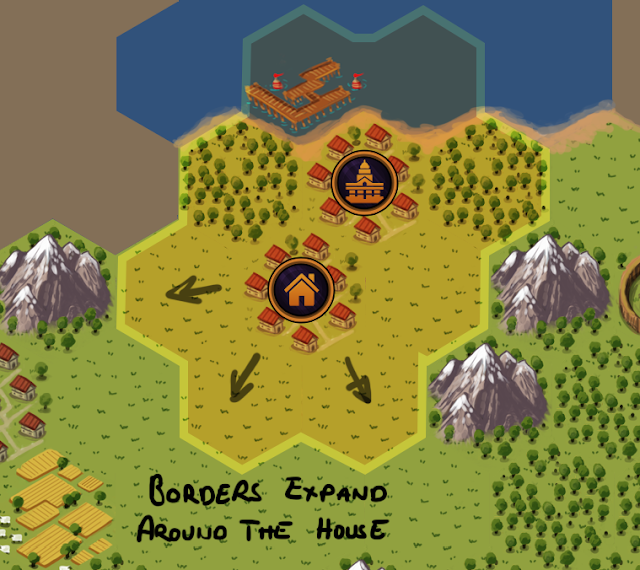 In order to expand borders players would have to build more houses. 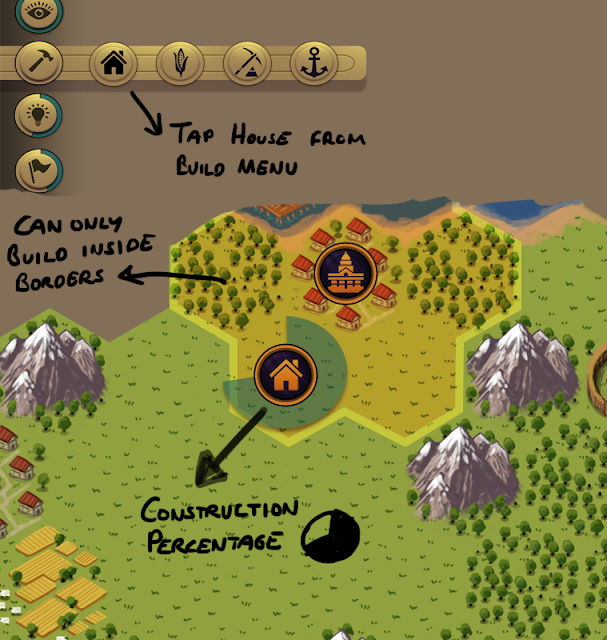 Tap the build icon, tap the house icon, place the house on a tile inside your borders. Wait a couple of turns for the house to be built. Structures can only be built in player’s borders. Houses can be built to expand borders. The cost values should be balanced after a prototype testing. Provides 5 pop every 10 seconds and Increases borders by 1 tile radius around the house. Allows armies to transform into ships and travel on water tiles. The general idea is if a tile has rugged terrain like a mountain, swamp etc, its harder to pass over it so units move slower. Logistics and sailing upgrades allow units to lower the movement speed penalty on tiles. 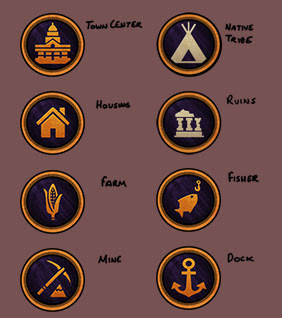 Some tiles will have resource signs on them (food, materials, fish) these signs show there is a natural resource deposit on that tile and the players can build farms, mines or fishing boats to exploit the resources of the tiles. Game always ends after x number of turns. The player with the most score wins. (every action the player takes should be calculated as a score). If all the town centers controlled by the player is captured the player is defeated and removed from the game. Resources - Maybe only 2 resources should be used. Food and coins. Coin is used to train armies, build structures and research while food is used to grow your city. Coin - train armies, build structures, do research. Towns will produce a small amount of coins per turn depending on the town’s level. A level 1 town will produce 1 coins every 10 seconds, a level 2 town will produce 2 coins every 10 seconds etc. Another way to earn coins would be to build houses inside borders, each house will provide a small amount of coin per turn. Mines can be built on the raw material resource nodes (as before) to increase income per turn. Mines should only give coin once (not per turn) to resemble the resource being depleted. Food - Food is used to grow your towns. For example 3 food is needed to grow a level 1 town to level 2. 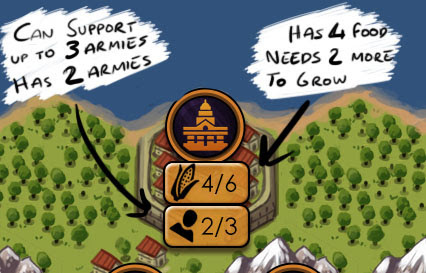 A level 2 town will allow its ruler to build 2 armies. (so town level acts as a cap limit for armies each town can support) Larger towns increase borders around them and also give coins every few seconds. A level 2 town will produce 2 coins every 10 seconds etc. 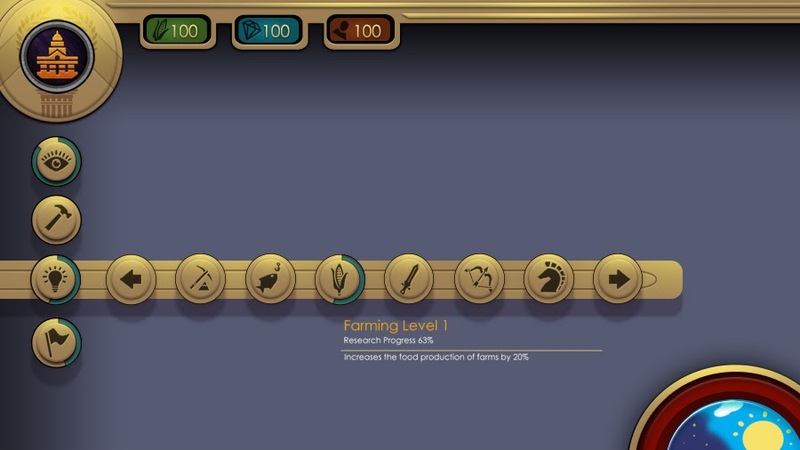 Harvesting food requires the player to build a structure on the food node (as before) so when a food icon is discovered inside your borders you can open the build menu and build a farm or fisher by paying coin. Farms and fishers should only give food once (not per turn) to resemble the resource being depleted. What will happen if a town is stuck at level 3 and cant find enough food nodes around it? Send armies to capture new towns? Construction - Should cost coins only. Max 30 seconds to build anything for a faster game? Research - Should cost coins only. Max 30 seconds to research anything for a faster game? Borders - can only be increased by growing town centers or by capturing native villages and turning them into town centers.